We have yet more news from Zelda Dungeon, this time on a new feature to Ocarina of Time 3D called “visions”. 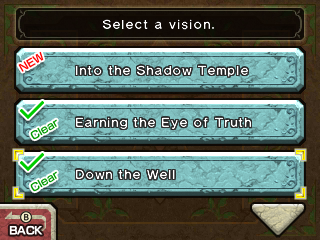 Visions is the equivalent of the hint system or “Super Guide” in other games. The “visions” go for about 10 seconds and consist of a number of clips to give you hints on what to do in the game. Also noteworthy is that Dan Owsen is back with Nintendo of America, and is proud of this new hint system as it doesn’t spoil everything and still gives players a sense of accomplishment. There seems like there will be quite a lot of these visions, although we’re not sure on how many. The hints are given through new large Gossip Stones, and although available right from the start, more are unlocked as you progress through the game. Interestingly this whole visions concept screams that the Hero of Time is a prophet to me.